Don't know about you, but I hate to use a stamp set or die only a few times, only to be tossed aside by the latest and greatest. Just don't have the space or $$ for a constant stream of new stuff. Now, don't get me wrong, I very much enjoy purchasing a few new things every once in a while. still buy too much, but I'm working on that. So, I've had this die for months and decided it was time to use it again. And I'm glad I did! 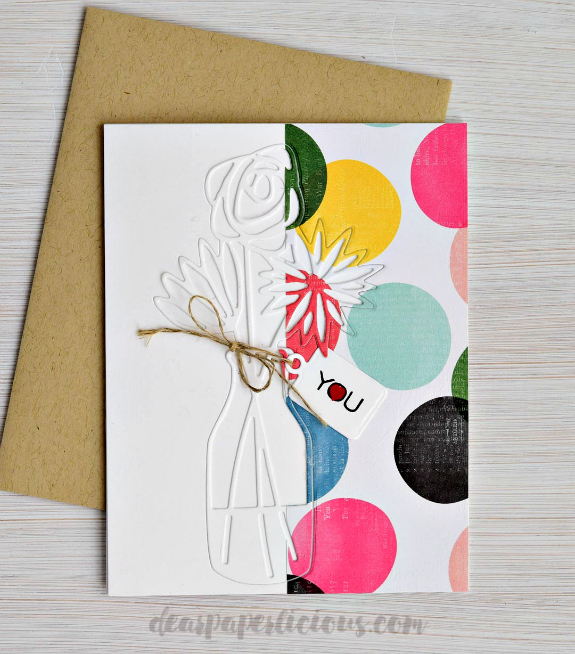 Love products that are versatile, and this Concord & 9th's Bouquet Die* fits that bill. Sympathy, wedding, birthday, love you, whatever -- this die works. Adhered half of card front with patterned paper (a friend gave it to me and I do not know the manufacturer, but isn't it fun? Love how the circles have a little pattern on them). Die cut the card front and set aside the die cut. Made a tag with Concord & 9th's Bags & Tags die. Stamped "YOU" from Essentials by Ellen Totally Awesome* and a heart from Concord & 9th's Beautiful Words*. Tied the tag around the die with twine and adhered onto the card. love how you created your card Joan - you should be delighted! so fun, love those the big polkas! I hear you. I buy way too much stuff, using internationla shipping costs as an excuse to buy in huge batches. By the time I receive my supplies, the industry and its leading bloggers have already moved on the latest and greatest new products... I'm trying to become more selective at what I'm buying (not always successfully) and am trying to start using my stash more, so I don't have to create another $15 card. Love your card. Such a great way to use your patterned papers. This is absolutely beautiful Joan. It is nice to see new ways to use the products we have. I am a (young) grandmother with no income and a husband who is getting ready to retire. I cannot afford to keep up with all the new products that I'd like. I follow a lot of blogs/companies that I love but new products come out EVERY month. I HAVE to use what I have although (according to the blogosphere) it is out of date. LOL I totally enjoy seeing new uses for past releases. They are still beautiful stamps/dies! What a great "pop art" card!! Just my style. Absolutely wonderful, Joan, your creative juices were really flowing when you came up with this beauty!! It's very delightful! Those polka dots are fabulous! I don't mind using old stuff, but I'm sucked in by the new stuff, too. Trying to clear out my stamp room and leave only the things I truly love in stamping. Wonderful mix of stark white and bright colors Joan B!